The FingerReader attaches to the users finger and reads text in real time. FingerReader, a prototype manufactured using a 3-D printer, aims to give the visually impaired affordable and immediate access to printed words. 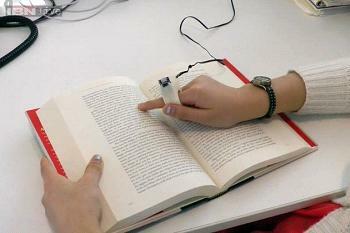 It attaches to the user's finger like a ring, and is equipped with a small camera that scans text. A synthesized voice then reads words aloud, and is able to recited anything from important forms to restaurant menus. It is also capable of translating foreign languages, and works virtually anywhere. Special software tracks the finger movement, identifies words and processes the information. The device has vibration motors that let readers know when they stray on the page from the script. 62 year old Jerry Berrier was born blind, and the appeal of the FingerReader for him lies in its portability and offer of real-time functionality at multiple places- including schools, offices and restaurants. "When I go to the doctor's office, there may be forms that I wanna read before I sign them," he said. Berrier also noted there are other optical word identifying devices on the market for those who are visually impaired, but none that he knows of that will read in real time. MIT professor Pattie Maes, who founded and directs the Fluid Interfaces research group that is currently developing the prototype, says the FingerReader is like "reading with the tip of your finger and it's a lot more flexible, a lot more immediate than any solution that they have right now." Development of the device has taken three years, and has involved software coding, experimenting with multiple designs, and responding to feedback sent by a test group of visually impaired people. Roy Shilkrot, who is developing the instrument at the MIT Media Lab, says there is still much work to be done before it is ready for consumers- including making it work on cellphones. Shilkrot hopes that the FingerReader will be sold at a reasonable and affordable amount, but is unable to estimate a price. Could this device open new doors for those unable to see? Let us know what you think in the comments.